Founded in 2001 by Dr. Stefano Guandalini, our center conducts research and provides education and patient services for celiac patients. Our doctors offer comprehensive diagnosis and treatment of celiac disease. The University of Chicago Medicine is internationally recognized as the most comprehensive celiac center in the world. We provide expert diagnosis and treatment for both children and adults as well as extensive patient education and support. Our groundbreaking research and innovative programs are dedicated to finding a cure for celiac disease. As we work toward the cure, we're raising awareness and diagnosis rates through education and advocacy efforts. There are many things I think that make our University of Chicago Celiac Disease Center truly unique. The most important thing is that we are very ambitious. So our goal is not just to be there for optimized patient care or to be working for advocacy for celiac disease or to be advancing research and science on celiac disease or to be aiming at education. What makes us unique is that we really want to cover all these aspects. And we have a group of dedicated physicians and scientists within the center that work together to cover all these bases. So there is research, which is basic research, advancing in, really, a world class way the field, really pushing the envelope and trying to understand and break new grounds in understanding celiac disease and possibly even reaching a cure. This is one of our main goals within the next several years, to actually find a cure for celiac disease. We also have in terms of research very active projects that go on that have to do with clinical studies on celiac disease on a number of different issues. And this is the research component. Our educational component has been always very, very active. It's at the core of the center's mission. One of the examples I can give you is the fact that we have been organizing for several years a unique course for doctors. And we call them the preceptorship days, and this happens every year in December. And it's a two-days, fully mesh, hands-on course on celiac disease that we offer to a selected group of physicians or dietitians or nurses from all over the country that come here to see how we deal with our patients and to hear it informal lectures, advances in celiac disease, to discuss their own cases with us, to see biopsies and discuss them. So it's an intense course that we think is very useful to spread the word and increase the education. We offer on our website, also, a wealth of updated, clear, and scientifically sound and clean information on celiac disease for our patients and for those who want to get information. And then on the area of optimizing medical care, we offer it to each newly diagnosed patient with celiac disease, a gift package that comprises a number of products [INAUDIBLE] free and more importantly, brochures and educational materials. So as you can see, there is a wide spectrum of activities that we do. And I'm just touching the tip of the iceberg here. Well, of course, a large bulk of our population is from the Chicagoland area. But we do have patients that come from all over the place. I've seen patients from Seattle or from Florida, from Arizona. We have patients from Texas. In addition, when we do our screening, one of the things that are center does a free screening for celiac disease. We hold this usually in October. Typically we have patients from four, five, seven different states that travel to be tested by us. Well, as I said before, we are ambitious. The main goal for the years to come is to find a cure for celiac disease. You may think this may not be that necessary. After all, we're dealing with a condition that is fully reversible on a gluten-free diet. In reality, this is not so. Studies have shown that about a third of the adult patients, especially with celiac disease, fail to go into complete remission on a diet. There is still some signs of intestine inflammation that persists. So that's one thing. In addition, 3% to 5% of the adults that are diagnosed with celiac disease eventually develop what we call a refractory celiac disease, which is a serious condition which has also some lethality associated with it, so increased mortality. And so to find a cure for this condition would actually be absolutely beneficial. In addition, if you unlock the mechanisms that lead to the immune conditions and are able to understand how to block them, this might theoretically be extrapolated to other conditions, thinking diabetes, thinking lupus, multiple sclerosis, et cetera. So our most ambitious goal most definitely for the next few years is to find a cure. We have an outstanding team of researchers led by Dr. [INAUDIBLE] that are doing this work in a really groundbreaking way. So I'm very optimistic about that. It will take time and money, for sure. But it's a 10. We are ideally positioned for that. People with celiac disease often receive no instruction on the only medical intervention to treat their condition: strict adherence to a gluten-free diet for life. As a result, newly diagnosed patients struggle to learn the diet on their own, often consuming gluten by mistake and delaying their recovery. 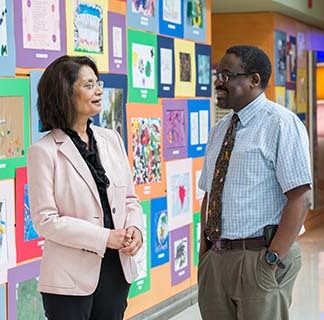 The UChicago Medicine Celiac Disease Center is working to properly educate patients and medical professionals around the world. Stay informed about the latest celiac research, news and upcoming events from our center. Whether you are a researcher, clinician or someone living with celiac disease, you may find our events of interest. If you’d like to support our efforts to cure celiac disease, learn how to make a donation today. We provide a free basket of sample gluten-free foods and resource materials helps to instruct newly diagnosed celiac patients and dietitians on the gluten-free diet. Our team works year-round to educate people with celiac disease and the public about diagnosing and treating this condition. We offer a two-day training course about celiac disease for physicians and other medical professionals. Our world-renowned celiac disease researchers are working towards curing celiac disease every day. We have one of two research teams in the world that is working to understand the nature of the immune system in the gut and the intestine's earliest response to the presence of gluten.